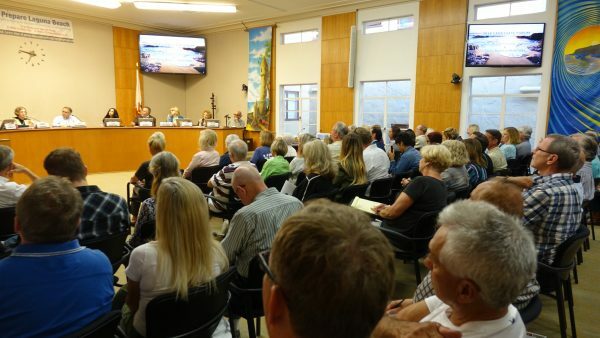 The Laguna Beach Chamber of Commerce and Laguna Beach Board of Realtors co-hosted the candidate forum for an audience that packed the City Council Chambers. Candidate Elizabeth Bates was absent. The topic of homelessness brought up some of the most heated discussion among the candidates at the forum. Councilman Rob Zur Schmiede said he’s optimistic that federal judge David Carter will compel South Orange County cities to start providing shelter for homeless people as part of a lawsuit brought by the American Civil Liberties Union against the County and other Orange County cities. “I think it’s going to force surrounding cities that are doing zero to deal with the problem,” Zur Schmiede said. Accountant Cheryl Kinsman said she would like to see more foot patrol police in the downtown and bike cops on the boardwalk, but didn’t offer suggestions on how the city might be able to pay for the additional officers. As someone who volunteered to help indigent homeless people in her home state of Rhode Island, Allison Matthews said she is sympathetic to the hardships facing those living on the streets. Council member Toni Iseman said it’s important to remember that Laguna Beach’s homeless are chronically homeless—meaning they are often living with a mental illness and/or addiction—not homeless because of an economic situation. “I fought that we [should] not have permanent supportive housing in Laguna Canyon, that was never going to work,” she said. Candidates were also asked to share their thoughts on the Design Review Board’s role in overseeing new development in the city. The appointed five-person panel was established to make sure new construction complies with the General Plan, Local Coastal Program, zoning standards and other design criteria in the municipal code. Some residents have complained that the Design Review Board unnecessarily adds to the cost and time involved with renovating a home or business. Opponents also claim that the board’s authority to deny building entitlements infringes on their property rights. Art gallery owner Peter Blake was among the most vocal opponents of the panel. Nonprofit CEO Judy Mancuso acknowledged that there are some properties in town that will always be considered historic and therefore protected from demolition or alteration. However, she agreed with Blake that the board has too much power over development. “If I’m on the council we will put an end to this,” she said. Lorene Laguna also joined the chorus of candidates who vented frustration about the cost associated with presenting and changing architectural plans for the Design Review Board, saying that the process needs to be reformed. In contrast to many of the challengers, Zur Schmiede came to the defense of the Design Review Board, saying that it’s a rules-based process. He claims that the panel doesn’t have the kind of unfettered ability to do what it wants because the City Council provides a backstop in cases where property owners want to appeal a decision. A bigger concern for businessman Paul Merritt is unpermitted construction at oceanfront homes and why the city hasn’t been able to put a stop to projects that haven’t received local coastal development permits or approval from the Coastal Commission. Candidates were also asked to talk about how they would help Laguna Beach business owners who are struggling as they lose business to Amazon and other online shopping platforms. Business owner Sue Marie Connolly said consumers are looking for an experience that they can’t get while shopping on Amazon. She’d recommend that retailers incorporate food or coffee to entice shoppers to linger in their stores. Planning Commissioner Sue Kempf said she would like to see the City Council loosen parking requirements so new business owners don’t feel as restricted when trying to introduce a new commercial use downtown. She also favors allowing more mixed-use development in the downtown where retail operates on the ground floor and residential units are on the second or third story. Kinsman added that unfortunately, there aren’t businesses attracting her to shop downtown for essential household items. “The things that I buy downtown aren’t things that I buy in my everyday real life,” she said. The candidates vying for three seats on the City Council will have plenty more chances to espouse their views at an array of forums throughout September and October. On Friday, Sept. 14, from 6-8 p.m., the Laguna Beach Police Employees’ Association and Firefighters will host a joint Public Safety Forum for the Council candidates. A moderator will ask candidates questions prepared by the Police Association and Firefighters relating to current public safety topics and issues. Attendees will also have an opportunity to submit questions to the moderator related to public safety. The forum, which is a free event and will be open to the public, is set to take place at the Top of the World Elementary multipurpose room, located at 21601 Treetop Lane. Village Laguna will host its own forum on Monday, Sept. 17, from 7-9 p.m. at the City Council chambers, 505 Forest Avenue. John Monahan will be the moderator, and the forum will be telecast on Cox channel 852. For more information, visit www.villagelaguna.org. The Laguna Beach Arts Alliance will hold a candidate’s forum on Saturday, Sept. 29, at 9 a.m. at the Laguna Playhouse, 606 Laguna Canyon Road. StuNews and KX 93.5 will hold a forum Tuesday, Oct. 2 at the Women’s Club of Laguna Beach, 286 St. Ann’s Drive. Admission is $20, and proceeds benefit Tune In, Drop Out, and Vote. Shaena Stabler and Tyler Russell will moderate the discussion. For more information, visit KX935.com. Laguna Beach Seniors and the League of Women Voters will hold a forum on Monday, Oct. 8, from 6-8 p.m. at the Susi Q Center, located at 380 3rd Street. Rounding out the election season, the Laguna Beach Independent will host its own free forum and town hall on Oct. 22 at the Laguna Playhouse. The forum will begin at 6 p.m. and will be moderated by Ben Simon, former Design Review Board member, and Allison Jarrell, editor of the Independent. The event is sponsored by Firebrand Media and the Laguna Playhouse. Toni Iseman: “too much development in the city” Is her plan to keep Hotel Laguna and Coast Inn vacant? What about the village entrance and FOA grounds are those developments ok because she is involved. I guess she thinks we should all live in historical shacks with mold, termite damage and rotting wood. I guess shame on us for trying to make a home safe and fit a modern family. With out development many homes would not last another 50 years. Don’t even get me started on her support for local artists and shops her closing statement started with “I shop online at Christmas” how lazy I am sure the recipients would be happier with art from Sawdust than Chinese made crap from Amazon they can buy.